The final Hunt Gallery opening and exhibition of the academic year is the 2018 Department of Art, Design and Art History M.A. 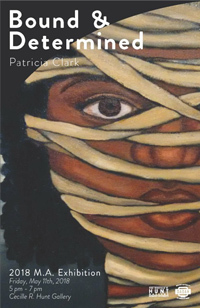 Exhibition, "Patricia Clark: Bound and Determined." Clark had a recent solo show of paintings at Bruno David Gallery. This exhibition of paintings and video is thoughtful, timely and even provocative. The reception on Friday, May 11, 5-7 p.m. in Hunt Gallery is free and open to the public.